Syracuse’s delegates joined more than 5,000 others from high schools, colleges and universities around the globe for a week of events and activities designed to shed light on the inner workings of the United Nations. Representing the Republic of Ecuador, the University’s MUN delegation took part in activities at the newly renovated UN General Assembly Hall and at neighboring hotels. The delegation was made up of 23 international relations majors (two of whom were alternates) from the Maxwell School of Citizenship and Public Affairs and the College of Arts and Sciences. Sponsored by the National Collegiate Conference Association, NMUN encompassed 21 committees, as well as two security councils. Delegates worked feverishly to propose resolutions that addressed a myriad of topics paralleling those in the real world. The program also contained keynote addresses by Jan Eliasson, deputy secretary general of the UN, and Luis Moreno-Ocampo, the first prosecutor of the International Criminal Court. Francine J. D’Amico, associate professor of international relations in the Maxwell School, is the delegation’s faculty advisor and chief instructor. The University’s MUN delegation has received many “outstanding” awards throughout its career, including one last fall in Washington, D.C., where it represented the Republic of Chile, and another last spring in New York City, representing the Tunisian Republic. In preparation for this year’s spring conference, D’Amico’s students met twice a week, for two months, to study the history, culture, politics and foreign policy of Ecuador; UN history, structure and operation; international negotiation and UN politics; and resolution writing and negotiation simulation. Now that the conference is over, delegates can look forward to several weeks of debriefing and laying the groundwork for the next spate of events, where Syracuse is representing countries in the Asia-Pacific region. Most of the current team is made up of seniors, led by Head Delegate Ivan Zhivkov and Assistant Head Delegates Pamela Davis and Claire Molk. Remaining seniors are Emily Becker, Rebecca Brown, Jeahyung Chang, Bryce Davis, Pamela Davis, Mike Getto, Jacky Green, Phil MacDonald, Kelsey Modica, Maryangel Rodriguez, Tory Savage, Ana Siberio, T.J. Tree and Ruitong Flora Zhou. The team’s juniors are Lili Dalton, Patrick Fallon, Marcelo Fuentes, Emily Malina and Gabrielle Sferra. Alternates are Anjali Shrestha ’15 and Ian Green ’17. 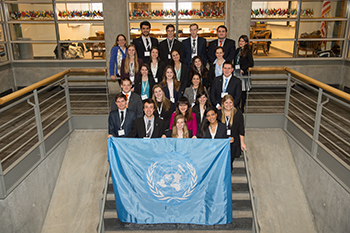 Syracuse’s participation in NMUN is made possible by support from the dean’s offices of the Maxwell School and the College of Arts and Sciences; the iLEARN program in Arts and Sciences; and the estate of Robert J. Mowitz ’41, G’48, in conjunction with his sister, Evelyn ’31.